Who doesn’t love a good pho soup, especially on a cold and rainy day? But it’s usually on those types of days that you just want to stay at home and not have to leave the house to get it. The secret to a good pho is all in the broth, and well, I haven’t exactly mastered the art of making pho broth from scratch, but I have found a super simple and delicious way to make it at home. Traditionally, bone broth is prepared by the prolonged boiling of animal bones into a savoury liquid, which breaks down the collagen, releasing all the nutrients. As you can imagine, this does require a little bit of work. 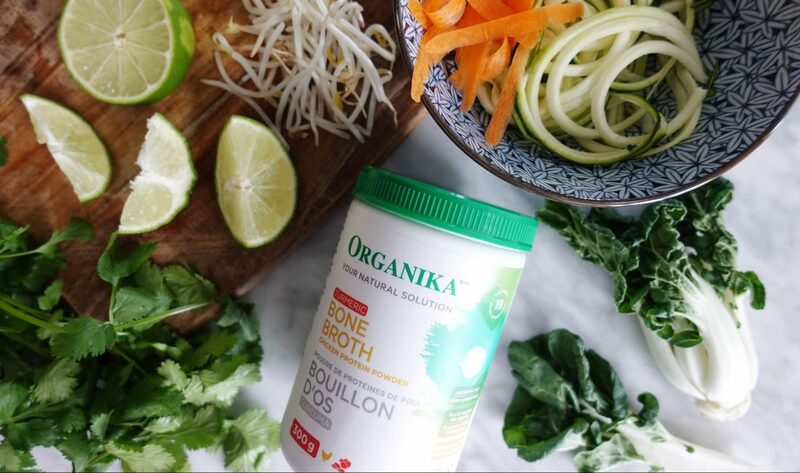 Enter Organika® Bone Broth Protein Powder which is available in original or ginger and turmeric (if you prefer a bit of spice). It’s simmered 24-48 hours to extract the maximum amount of nutrients – and they already do all of the simmering for you. Using this as your soup base, you get to reap all of the benefits of collagen, and it’s also rich in vitamins and minerals. When consumed on a regular basis, bone broth has been known to support gut health (can help with IBS, leaky gut, etc. ), help relieve joint pain, and boost the immune system. This pho recipe is SO simple, you can even do an on-the-go version by adding the powder to boiling water and throwing in your veggies, topped with your favourite herbs and hot sauce – and there you go, Pho! 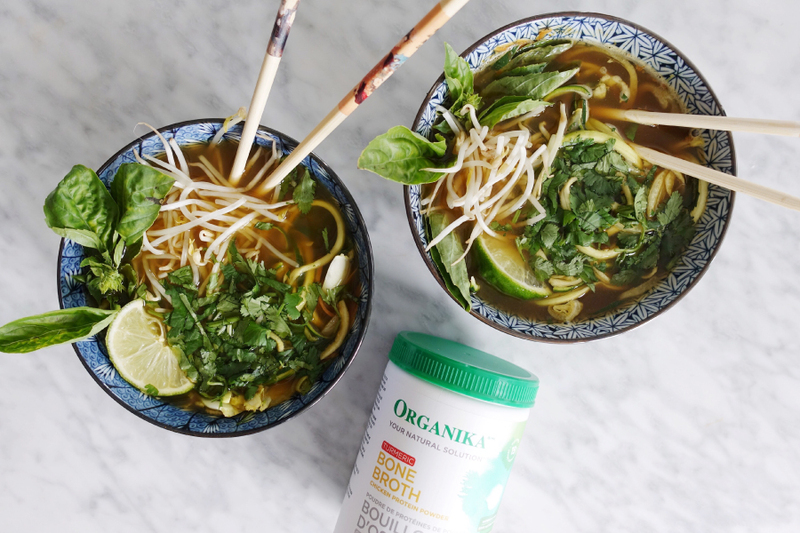 Make a healthy pho at home using Organika's bone broth protein powder as your base. This super simple recipe supports gut health and can also help to support the immune system. Not to mention it's downright tasty. Add your favourite herbs and hot sauce on top for a delicious and nutritious pho. In a large stock pot, add in the water, Organika Bone Broth Protein Powder, onion, carrots, garlic cloves, cinnamon sticks and coconut aminos. In four soup bowls, prepare each serving by adding in zucchini noodles to the bottom. Top with Pho broth. Top each bowl with desired amount of herbs, vegetables, sriracha and coconut aminos & enjoy! You will need a big pot and a spiralizer.